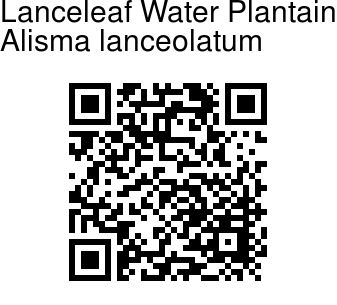 Lanceleaf Water Plantain is an erect, hairless aquatic herb. Leaves are broadly linear-lanceolate, pointed, 6-7.5 cm long, 1-1.4 cm broad, somewhat glaucous, tapering into as long as or much longer stalks. 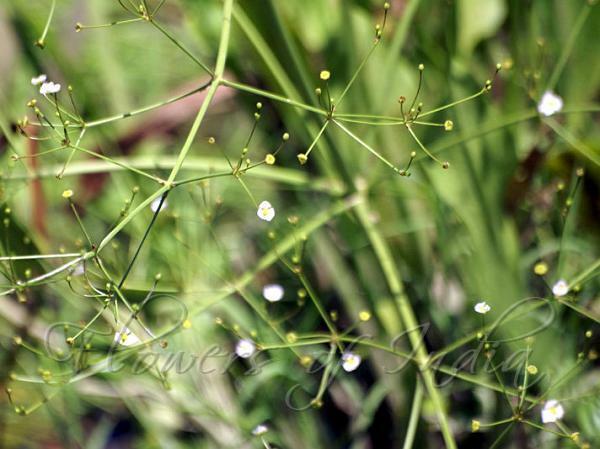 Flowers are borne in panicle of 3-6 ascending branches and stalks per verticil, 30-40 cm long. Flowers are white or light purplish-pink, about 1.2 cm across. Flower-stalks are slender, 1.5-1.8 cm long. Bracts are triangular- ovate, 5-10 mm long, long-pointed. Sepals are triangular-ovate, 3 mm long, 2 mm broad, with membranous margins, acute. Petals are membranous, oblong, 5-6 mm long, 2-2.5 mm broad, acute. Stamens with 2 mm long filaments, anthers elliptic-oblong. Styles are longer than the ovaries, erect. Achenes are obovate, about 2-2.5 mm long, pale brown, with 1 or 2 furrows on back. Seeds are oblong, about 1.5 mm long, reddish brown. Lanceleaf Water Plantain is native to Europe and West Asia. Flowering: June-September.